One of the books I enjoyed reading over the summer was Fail: Finding Hope and Grace in the Midst of Ministry Failure by J.R. Briggs. I don’t think I’ve ever read a book exclusively about failure. I have read leadership books that discuss aspects of failure and how to overcome it. I’ve read book about discovering success in the midst of various circumstances including failure but again, I’m not sure I’ve read anything exclusively on failure. After all, who would want to voluntarily remember, dissect and process the nature of their many personal failures? Well, it turns out I would. And you might want to also. “I am hopeful and disillusioned about the future of the church. I’ve asked dozens of pastors and church leaders to describe the lowest point in their ministry. Too often the answer is “Right now.” … As I survey the landscape of churches, I see an overwhelming amount of lonely, wounded and discouraged pastors who’s souls seem to be on life support. The thought jolts me, Is this what Jesus had in mind for pastors – a life absent of joy and peace, and with omnipresent stress and emotional hardship? The ridiculous amount of encouragement that doesn’t come across as trite. I’m still not sure how J.R. did this. While my life is not perfect/whole, I was not sure if I would be able to connect with concept enough. Though some might disagree, I don’t actually think I have committed any galactic failures, (comment section is open:). I don’t walk around thinking myself as a failure and with God’s help and solid accountability, I’m confident my career will be scandal-free. But as mentioned in the previous post, I walk around more with a fear of failure and the nagging of what feels like a million little failures and moments I wish I could have back. This book gets that too. If you liked Leading with a Limp by Dan Allender, I think you’d like this. They have different objectives but the authors’ posture of vulnerability is similar. Further, if I remember correctly Allender’s pain is a bit further in his rear view mirror than J.R.’s and they writing at different life stages. Franky I would recommend that if you are leading (and place a high value on authenticity/vulnerability) that you buy/read both. Of course, I think everyone can read this but those in their 20’s and 30’s (early 40’s) will appreciate J.R.’s voice the most. It’s similar to the difference between Mumford/Macklemore processing their pain and Bob Dylan/Jonny Cash (they’re all great, but proximity feels to make a difference). He’s a reader of Eugene Peterson (who wrote the foreword), DWillard, SMcKnight, Bonhoeffer, and all the missional types. As mentioned, his voice is raw and fresh yet shaped by these great minds. Those who have not found enough closure to their past ministry pain. I found Fail to give me more scar tissue. The person who is in pain right now. In addition to prayer, supportive friends, let this book be part of your grieving process. 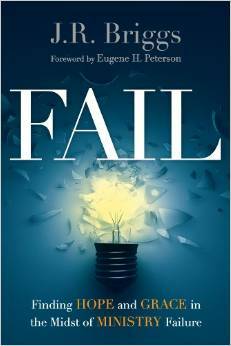 As one who hosts Reading Circles (book clubs that are more focused on the people than the books), I was struck by the thought of hosting one that read and discuss Fail here in the Greater Boston area. If you’re interested, let me know, I have a few ideas in terms of venue, format, duration, etc. Let me know, I can really see this happening in the cold, bitter months of winter. A bit of a disclaimer. I know J.R. a bit. We’re really acquaintances that social media has pushed to friendship. But we’re not that close because he didn’t ask me to read/review his book. Further, we have a lot of mutual friends and I believe they like me much more than him, but that could have shifted recently ;) Still, I sincerely look forward to our paths crossing again. Even more sincere, know that I’m not posting this as a favor, I truly appreciated this book and really believe his words are needed and timely for many. I was fortunate enough to attend the first Epic Fail Conference that J.R. put on and discusses at length in the book. At first, I had planned on going to support J.R. and my friends of the Ecclessia Network. While I have always kept my frustrations/pain nearby in some sense, that event came at a time in my life and ministry where things were on the rise, change was in the air for me and my family and we were grateful for the trajectory we were on. But the time leading up to it and the gathering itself gave me a deeper understanding of my pain caused by failure and what I needed to release. It’s all a process, a worthwhile one, hope you find it so as well. Here were my posts from the Epic Fail Conference – Post 1 and Post 2. Read his blog www.J.R. Biggs.com and follow him on Twitter @jrbriggs.